This is one of my families best recipes and these measurements are taken straight from a yellow piece of paper that's been carried from home to home for years. It's something I actually never had until I was older and have been determined to make. 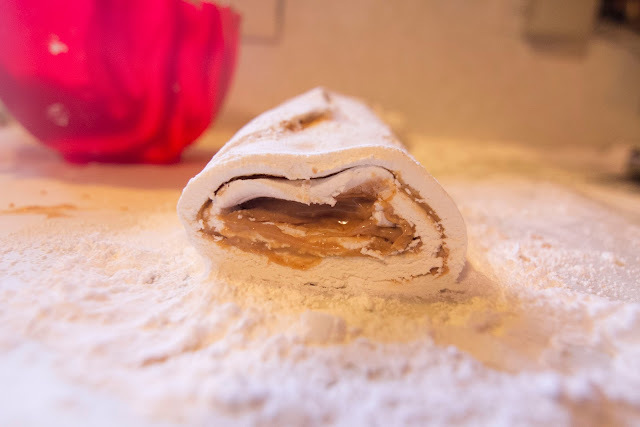 It's messy - you WILL get powdered sugar everywhere - and it's a trick to make. I've ruined a trash can and a rolling pin on my first time trying to make this alone. So guys, this recipe is as much for me as it is for you. Please get at me with any questions, this is probably one of the most complicated recipes I'll ever put up here. I promise if I don't know the answer, I'll ask my mom. 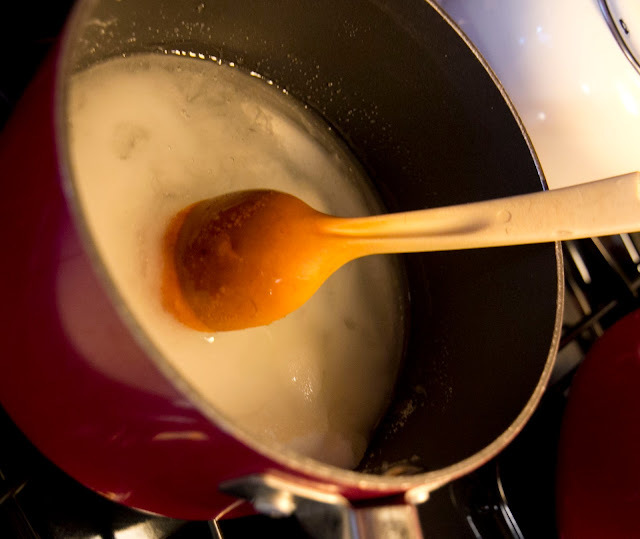 While your sugar starts to warm, break 3 eggs and get only the whites. You can do this a multiple variety of ways - we just take the yolk out with our hands to present a chance of the shell breaking. 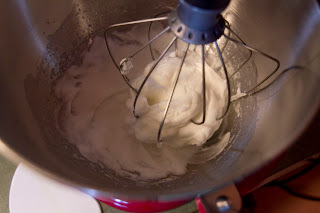 In a mixer on medium or medium high speed, beat the egg whites until stiff peaks form. 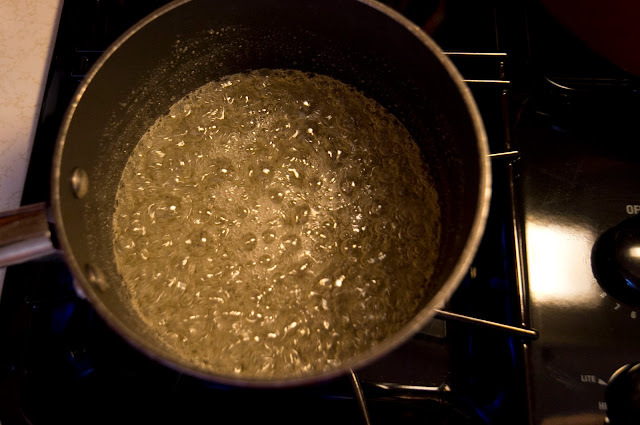 Your sugar mixture will start to boil. 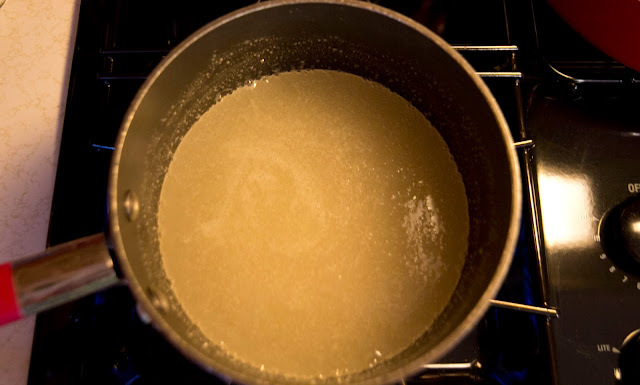 The best way to figure out when it is at the right stage is to use a cup of cold water and drop small amounts of the mixture into it. When the mixture gets to hard crack stage, it will still be clear, but it will almost crack on the side of your cup. Soft ball or hard ball where you can form it is too soft. If it starts to brown / caramelize, you've gone too far and get it out RIGHT AWAY! Seriously, we've ruined a trash can this way! Pour it down the sink or else it will ruin your pan. The sugar should not start to brown. A candy thermometer can help, but I actually had a candy thermometer in mine and it wasn't ready hard crack when it was starting to caramelize. 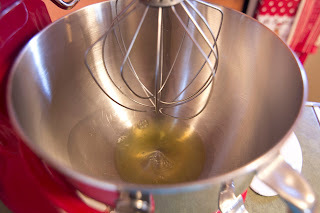 Once the mixture gets to hard crack stage, bring it over to your mixer bowl with the egg whites. 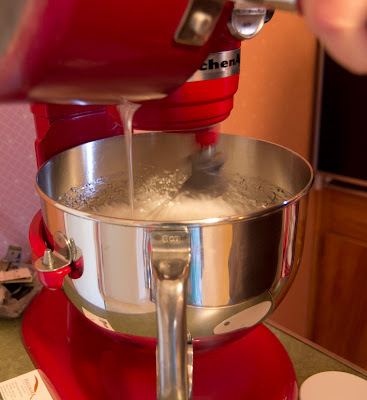 While the mixer is on a medium speed, begin to pour in your sugar mixture. Once all of the mixture is in, add in 1 teaspoon of vanilla. 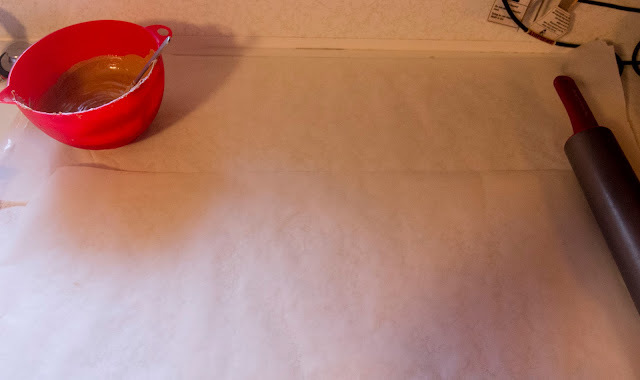 While you continue to mix the candy mixture on medium, sift the powdered sugar onto parchment paper. You need a fair amount of space - this is a pretty large amount of stuff you need to roll out! 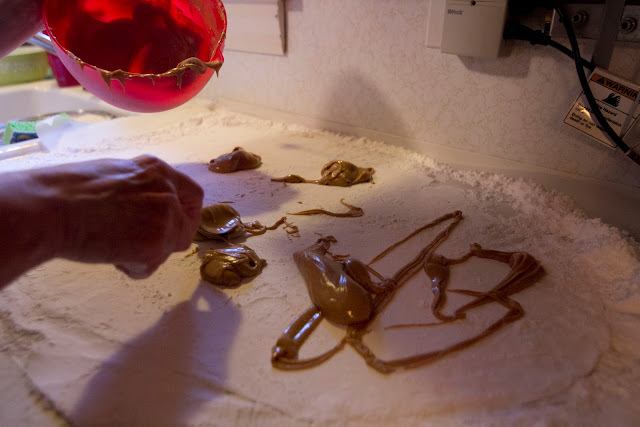 Once your candy mixture is well mixed, pour it onto the sugared area. 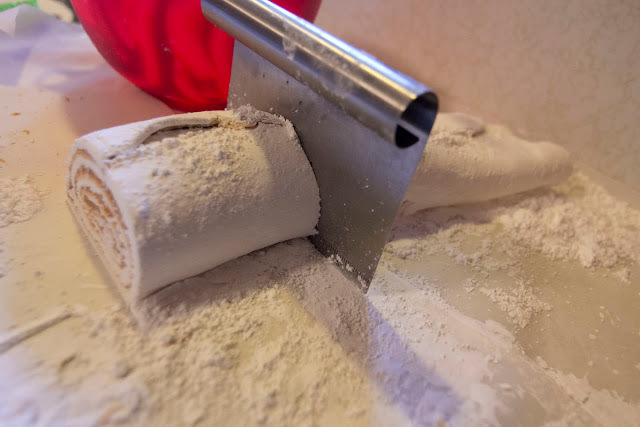 The powdered sugar acts as flour here. 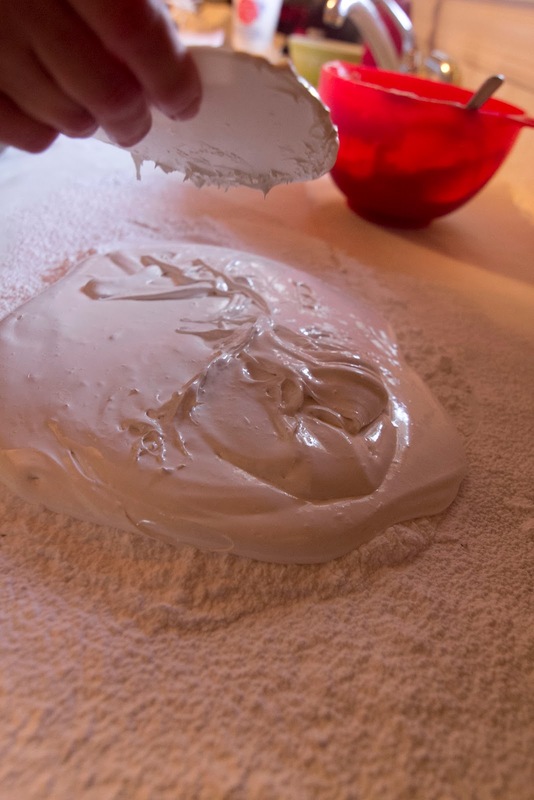 Mix the powdered sugar in until the candy does not stick to your hands. Form the mixture into a block like shape. 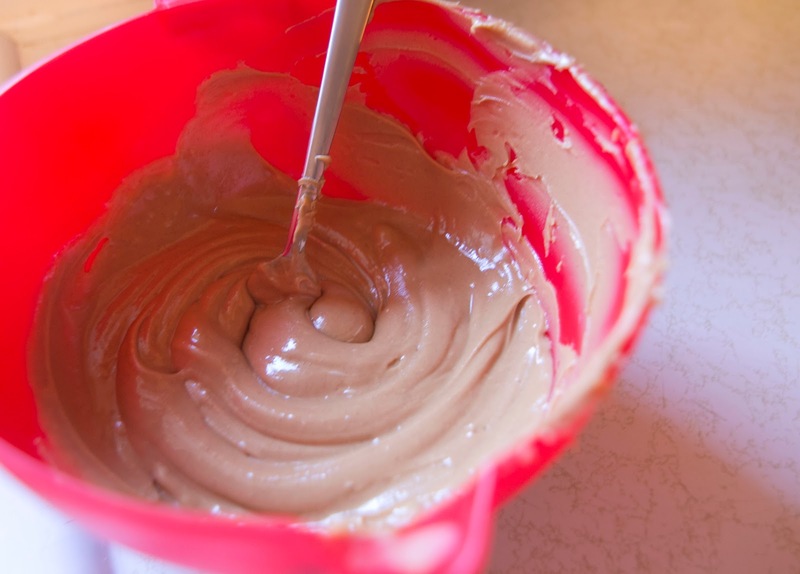 Roll the candy mixture out until it's about 1/8" thick. Try to keep it in an even rectangle as much as possible. In a new bowl, mash 5 tablespoons of softened butter. 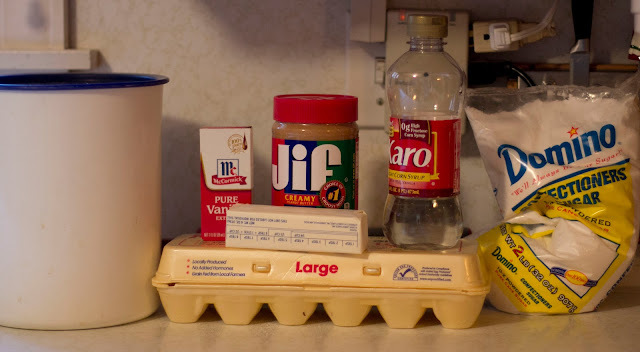 Add in 2 cups of peanut butter (1 16 ounce jar) and mix well with the butter. This makes it spreadable. Drop in lumps on the candy mixture and spread evenly - leaving a bit of space on the edges as it will squish out when you roll. 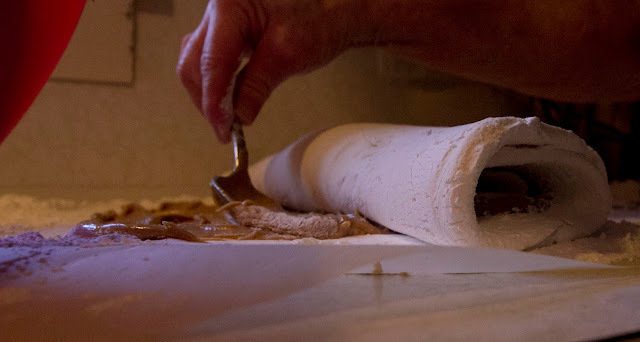 Once the peanut butter is evenly spread, start at one end and begin slowly rolling to form a roll! Once rolled, cut into pieces. 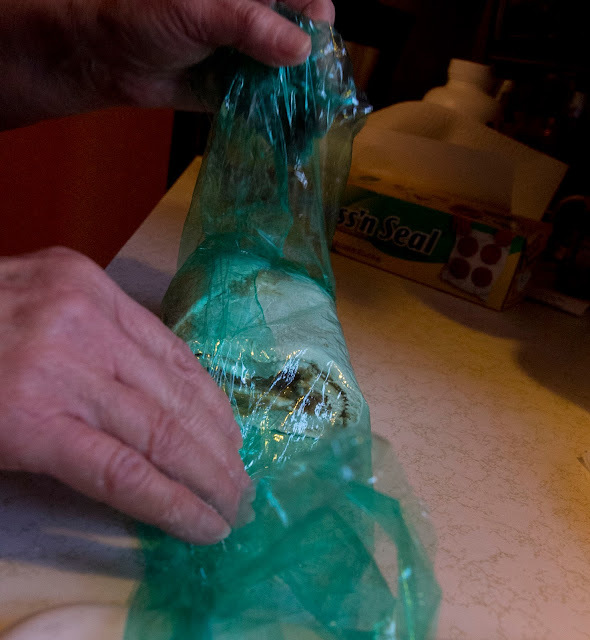 Wrap in saran wrap and store in a chilled area (fridge, or for us, a cold sun room) until the next day to eat! Oh wow, that looks intense-but so yummy and fun! 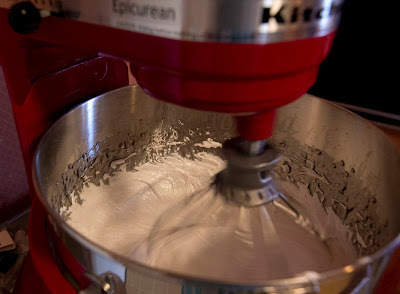 I love tedious baking endeavors so that I can challenge myself, and peanut butter is my favorite! How wonderful that this has been passed down for so long in your family! Wow! That's a whole project. But they came out beautifully! I feel like my Dad would like these! this looks so good. i always burn the sugar, but i might have to try this one! 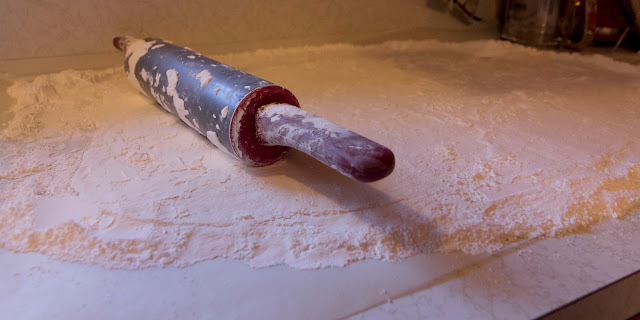 We have a similar holiday baking tradition in my family with a generations passed down recipe! I've yet to try making it because im not such a great cook and its very hard to make as well. This looks really good though, and yours turned out perfect! Oh... my gosh... This looks heavenly. I would love to sink my teeth into this (and my whole mouth and whole being and everything). I love peaunut butter so I can only imagine how delicious this is! i got excited when i saw peanut butter (my favorite thing ever), but then i read through the whole recipe and now i'm scared! HA! ruining a trash can?! i laughed out loud at "GET IT OUT NOW".. :) it looks delicious though, maybe if i can muster up the courage i will give it a try! This looks amazing. Candy peanut butter? I spent my entire life avoiding peanut butter but lately I've started to like it. You totally had me at peanut butter! Yum, you had me at peanut butter! This looks so amazing, and so intimidating, all at once. Looks delicious! I rather like dished that requrei a little more elbow grease, there's great gratification in eating something you worked so hard for! This look so delicious but I think I am a little scared to try it!!! If someone as amazing at cooking as you had issues then I am doomed! :) I will get up the courage to try it though! Umm.. wow! Just wow! I love family recipes and I love that this came from a yellow piece of paper! Makes it feel so authentic, original and full of tradition! Looks so good, all the more so because of how much time and effort goes into it! Love how your photos captures all that! Oh my gosh those look delicious! And they look fairly simple to make too! I'm definitely going to have to try this out soon! family recipes are the best! it looks so good katherine! oh my goodness, that looks amazing - you totally had me at peanut butter. Love family recipes that get passed down - they are the best! YUMMMM. That looks delicious. I need to try this recipe out! YUM that looks so good. I'm intrigued now, this is something I definitely want to try! Oh wow this looks AMAZING, although a bit intimidating! Is it SUPER sweet? It really is very, very sweet. Since the outside candy dough part is pretty much sugar mixed with sugar, it's definitely for people with a sweet tooth. 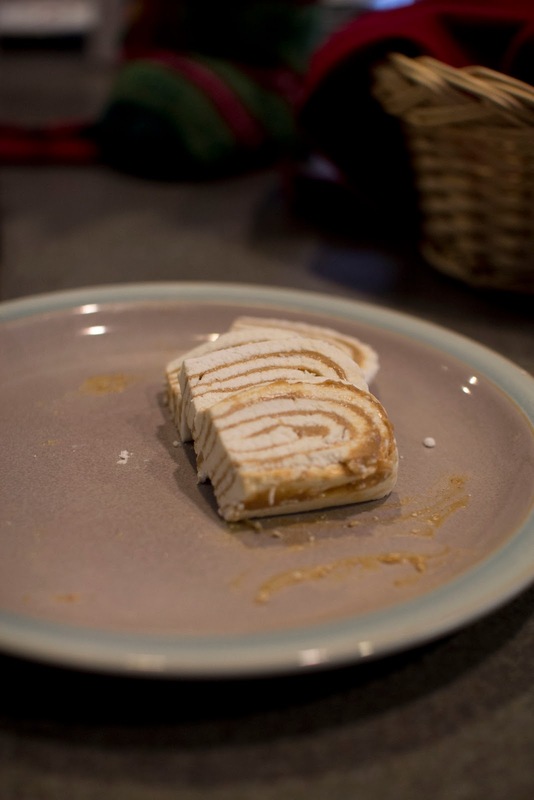 It's kind of as sweet as peanut butter taffy or something similar. Good grief, this looks incredible! Mmmm looks sooo delicious! I want a little piece right now!